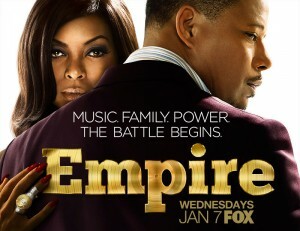 Hip Hop family drama, Empire comes to Fox Television on Wednesdays beginning January 7, 2015. Rising up as a former street thug, Lucious Lyon (Terrence Howard) has become the CEO of Empire Entertainment. He is the known as the king of hip-hop as well as an incredibly talented artist himself. He has three sons and not a care in the world. Suddenly and unexpectedly, all of that starts to change when Lucious finds out he has ALS (Amyotrophic lateral sclerosis, often referred to as Lou Gehrig’s Disease) and will one day succumb to the severely debilitating disease. Lucious knows that he needs to prepare and groom one of his three sons to take his position running the business. However, this will not be an easy task. His favorite son and youngest, Hakeem (Bryshere Gray) is an immensely gifted musician. Hakeem is extremely spoiled and does not have any idea of what real hard work is, nor does he care. The middle son, Jamal (Jussie Smollett) is much more compassionate and a talented musician. He avoids the spotlight unlike his brother Hakeem. The problem with Jamal is that he is gay. This is an embarrassment to his father and something his father does not understand. Finally, there is the third son Andre (Trai Byers). He is the oldest son and the CFO of Empire Entertainment. He is highly educated and a mind for business. Unfortunately, his father believes he lacks the charisma that is necessary to run an entertainment company. Andre’s wife, Rhonda (Kaitlin Doubleday) strongly believes her husband is deserving of this position. There is a much bigger issue that Lucious will soon have to deal with. Hell hath no fury like a scorned ex-wife. Meet Cookie (Taraji P. Henson) Lucious ex-wife who has been in prison for almost two decades from running drugs that helped pay for his early music career. After being released early she is on a mission to get what she feels she deserves from helping Lucious build Empire Entertainment that has allowed him and his sons to live comfortably on. Empire is family drama with many twists and turns. It is an emotional roller-coaster with an original soundtrack written and produced by Timbaland. This new drama is not to be missed! Cast: Empire stars Academy Award and Golden Globe Award nominated, Terrence Howard (Hustle & Flow, Crash, Prisoners, Lee Daniels’ The Butler), Academy Award and Emmy Award nominated Taraji P. Henson (The Curious Case of Benjamin Button, Taken From Me, Person of Interest, No Good Deed), Academy Award nominated Gabourey Sidibe (Precious, American Horror Story Coven, American Horror Story Freakshow, Tower Heist), Malik Yoba (Alphas, Revolution, ), Grace Gealey (television network debut), Bryshere Gray (television debut and accomplished musician), Jussie Smollett (Alex Haley’s Queen, Revenge, The Mindy Project, Ask Me Anything, The Skinny), Trai Byers (Americons, Jayhawkers, Selma), Kaitlin Doubleday (Catch Me If You Can, Waiting, Accepted ) and special guest appearances by Courtney Love and Naomi Campbell.